This week I told you about the Castle of Leeuwergem where I discovered the company Lex Antiqua , that sells beautiful engravings. To me, engravings are real pieces of art. 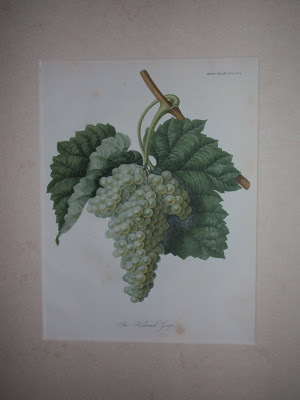 So I fell in love with these 4 engravings of bunches of grapes. These are dated 1820 and hand-coloured bij English craftsmen. Now I just have to find the right frames for them, and then I will hang them at home in our orangerie. This picture I took yesterday. A bunch of grapes of my own grapevine. 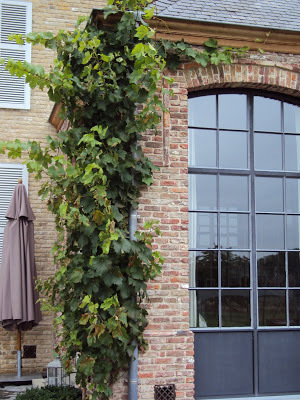 The grapevine growing at the wall of our orangerie. Gorgeous isn’t it? I am so proud of it! Lovely indeed, sure you will find the perfect spot! 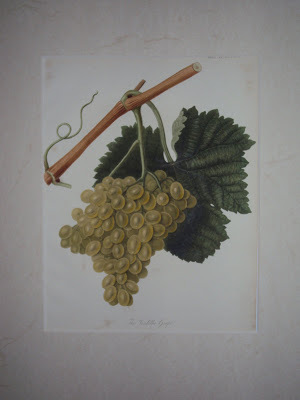 Wat een mooie gravures, ik heb er zelf een paar met rozen, niet antiek maar wel erg mooi. Je orangerie is een plaatje! Wat een prachtige raampartij! Welke kleur luiken heb je op je huis Greet? Zijn ze grijs? Wij hebben (donker)groene luiken, ik zou ze graag eens een andere tint willen geven, maar weet nog niet welke. You have cause to be proud of that grapevine. It is glorious! You have every reason to be proud of your gorgeous vine and its fruit. And the etchings are lovely. There is something so beautiful about grapes. They are simple yet speak the language of elegance, romance and abundance. I had to romove all of my vines a few years back when our precious little Pug was feasting on the grapes and they were making her sick. She is no longer with us, and I have started to let them grow back. Maybe next year the fruit will also return. 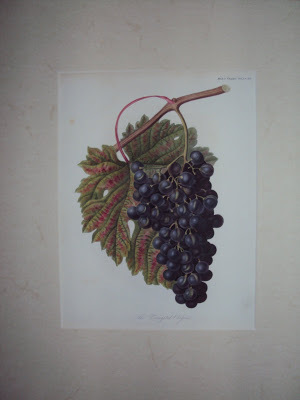 beautiful grapevines – prints and the real thing – the pictures remind me of a funny expression my father sometimes uses when someone offers him something to eat after a big meal – "no thank you" he says, "i just ate a grape"
Greet, these are totally beautiful, xv. Greet, they are gorgeous. I love grape vines but this may have something to do with the fact that they are everywhere in this part of France. 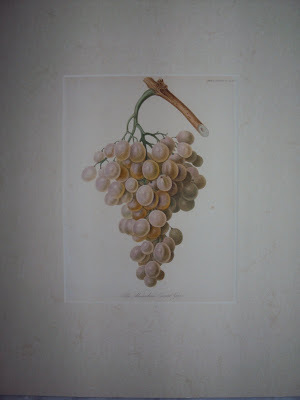 I think that the engravings are very nice and I can understand your pride of your own grapewine. 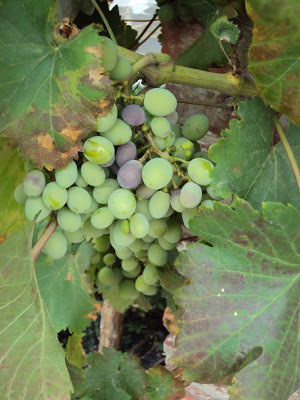 Our grapevine did not do well this year – yours looks so good and the grapes look juicy. Those engravings are beautiful. I too would be so proud IF I had a great grapevine. My wisteria when it blooms excites me with just 2 or 3 blooms.